In the end, we determined that it was not possible to produce an aggregate index by province–but the process revealed the steps that would be necessary to fulfill that vision. Given China’s burgeoning economic growth, rapidly expanding industries, large population and growing consumer class, many in the environmental field have an intense interest in how the nation will address its environmental problems. The country has made some impressive energy and resource efficiency gains, and environmental issues are an important part of the government’s efforts to build a “harmonious society.” Yet, as evidenced by the recent air pollution events in Beijing, there is a lot of progress to be made, and the government has yet to fulfill its commitment to data transparency. China’s Regulation on Environmental Information Disclosure, which took effect in May 2008, represents a major step forward, but implementation is still at early stages and much remains to be accomplished to tap the full power of public participation in environmental protection as embodied in the Aarhus Convention, the U.S. government’s Right to Know provisions, and the recently developed Access for All initiative. 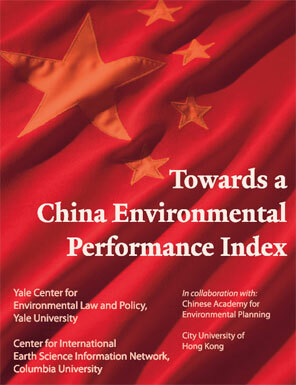 It is in this context that a team of researchers (myself among them), jointly led by the Center for Earth Science Information Network (CIESIN) at Columbia University and Yale University, have released the report, Towards a China Environmental Performance Index, that takes a first cut at assessing China’s environmental management and performance at the provincial level. Working closely with colleagues at the Chinese Academy for Environmental Planning (an arm of the Ministry of Environmental Protection) and City University of Hong Kong, we held three expert workshops over the course of two years, analyzed China’s environmental laws, and compiled the best available data. In the end, we determined that it was not possible to produce an aggregate index by province – but the process revealed the steps that would be necessary to fulfill that vision. The bulk of the report provides a component-by-component analysis of China’s policies and measurement practices. Charts and maps illustrate the issues for 33 indicators, relying entirely on official provincial statistics. In our recent work with countries we have sought to achieve a higher standard, by validating all data sources. Our decision to stop short of producing an aggregate index was based on concerns over data quality (to use statistical parlance, we had concerns over validity and reliability) and a lack of official policy targets for a number of the indicators we developed. Although we could have proposed interim targets, the crux of the matter was that we could not access raw monitoring station data that would have helped to assess data quality. This led us to have concerns about how much the official statistics reflected on the ground realities. For our global work (see the 2010 Environmental Performance Index (EPI) and the forthcoming 2012 EPI) it is true that we were unable to validate all data sources (especially those derived from official UN publications – which are becoming fewer in number); but in our recent work with countries we have sought to achieve a higher standard. What we did produce is a model framework for environmental performance indicators to assist the Chinese government in tracking progress toward policy goals, as well as recommendations for how the Chinese government can apply more aggressive performance metrics to environmental decision-making. China is making good faith efforts to raise environmental standards, partly due to the outcry of its increasingly affluent citizens for better air quality. Yet the government is also seeking to lift millions more out of poverty, and to do so at a pace that has rarely been witnessed. It seems clear, however, that China’s quest for economic development at all costs will create a legacy of environmental damage that will be costly to repair – unless action is taken now. To avoid the worst impacts, the government needs to have policy tools that are adequate for guiding and prioritizing action, and that is what an EPI would provide. The report is available in English here; a Chinese version will be available shortly. 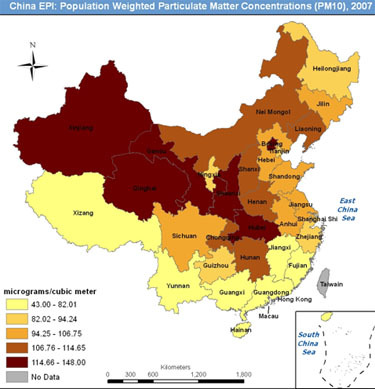 For more information, go to http://envirocenter.yale.edu/news/222/56/First-Independent-Review-of-Provincial-level-Environmental-Data-in-China/d,newsDetail.